San Diego’s Fall Science Fiction convention welcomes author Guest of Honor Patricia Wrede (The Far West, Shadow Magic, Dealing with Dragons, Thirteenth Child, etc.) The convention will take place at the Town and Country Resort Hotel from Friday, October 5 through Sunday, October 7. Mysterious Galaxy will be in our traditional location in the Dealer’s Room. More information on other guests (like David Brin, Nancy Holder, and the Kollin Brothers) and convention specifics at their website. Note that this year the convention has become Conjecture/ConChord: Conjecture is a literary-oriented sf/fantasy convention and ConChord is a southern California filk convention. Patricia C. Wrede's book Once Upon A Curse was available from LibraryThing Early Reviewers. 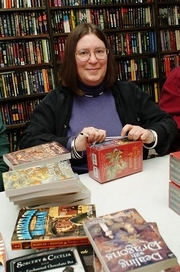 Patricia C. Wrede is currently considered a "single author." If one or more works are by a distinct, homonymous authors, go ahead and split the author. Patricia C. Wrede is composed of 13 names. You can examine and separate out names.